The first full-production i-MiEVs arrive in the U.K. in November and will be on roads in December. Mitsubishi Motor Corp.’s new i-MiEV is about to join police forces across the U.K., with the West Midlands department the first to receive the electric vehicle. 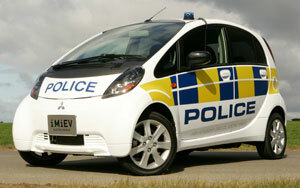 A law-enforcement version of the i-MiEV was showcased at the National Police Show in September, and MMC says it has been inundated with requests from U.K. police departments to test the EV. With a range of 100 miles (160 km) and a top speed of 81 mph (130 km/h), the EV is ideal for urban policing, MMC says, noting the i-MiEV has room for four adult passengers and equipment. “The i-MiEVs have been in the U.K. on trial for almost a year now, and we are delighted that police forces are able to see the future of zero-emissions driving requires no compromise,” Mitsubishi Motors U.K. Managing Director Lance Bradley says. Half a world away, Mitsubishi Motors Australia Ltd. is taking a different approach: loaning i-MiEVs to businesses and government agencies. Mitsubishi Australia President and CEO Robert McEniry tells The Daily Telegraph newspaper in Sydney the number of i-MiEVs shipped to Australia initially will be heavily restricted. The auto maker is planning a rollout that will begin with loans to companies and governments and then offering leasing arrangements by the end of next year. He predicts as production increases and unit costs fall, there will be greater opportunities for people to access the i-MiEV. “We are continuing our deliberations with our parent company to make sure we grab some (units),” McEniry tells the newspaper. “While it may be very difficult to get them into Australia this year to meet my own schedule, at the very latest, it will be the first quarter of next year and then we will be part of the production schedule from then on.